The academic diversity of a business school is broadly viewed through two lenses – that of a recruiter looking to diversify his workforce, and that of an aspirant preparing for competitive exams, hoping to enter the B-School of her dreams. Therefore, this Academic Diversity Report – the first of its kind on InsideIIM – will give you a synopsis of the academic backgrounds of the students of top management institutes in the country. 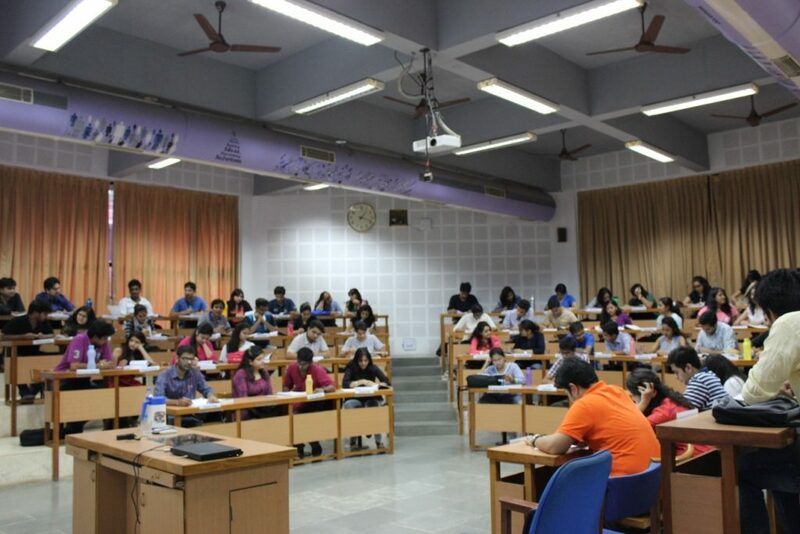 – IIM Ahmedabad, IIM Shillong and IIM Jammu lead as examples of the most academically diverse IIMs of the country. On the other end of the spectrum, IIMs Bangalore, Kozhikode and Kashipur are some of least academically diverse. – Private management institutes such as MICA Ahmedabad and SDA Bocconi Asia Center are some of the most academically diverse business schools of the country. MICA Ahmedabad tops the list as the most academically diverse business school of the country, with more non-engineers than engineers in the Class of 2020. – Management institutes under XUB, such as XAHR, XSoS, XUMG, XSRM, XSC-MBF, etc. are some of the most academically diverse. However, XIMB is an exception to this and has a lot of scope for improvement on this front. 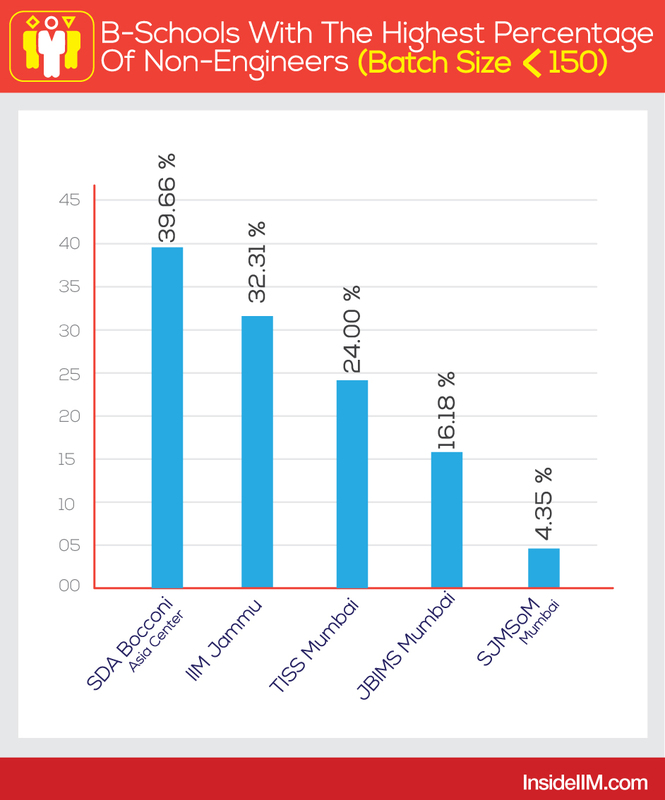 We received data of academic profiles of the batches of 35 business schools from different parts of India. – The veracity of data from 3 institutes (IIMs Ahmedabad, Lucknow & Kozhikode) could not be verified by Team InsideIIM and therefore must be viewed with caution. – The data for XAHR, XSRM, XSC-MBF, XSoS, and XUMG will be collated under the umbrella term XUB (Xavier University Bhubaneswar). The data for XIMB is separate from that of XUB. With an intake of over 300 students for their 2-year management programmes, these business schools have a massive challenge in maintaining a significant balance in the academic diversity of their respective batches. For example, while IIM Jammu is more academically diverse than IIM Bangalore, the batch size of the latter institute is over 6 times greater than the former, therefore presenting a bigger challenge for IIM Bangalore to bring in more academic diversity and sustain it. Turns out, the top business school in the country also hosts some of the most academically diverse students within its four walls! IIM Ahmedabad is an institute which has shown a significant increase in academic diversity – the Class of 2016 had 87% engineers; the Class of 2017 had 92% engineers, the Class of 2018 had 79% engineers, the Class of 2019 has 74% engineers and now, it has come down to below 70%. This could possibly be due to the fact that during Round 1 of the selection process, IIM A shortlists the top 5% of applicants from each of 6 Academic Categories mentioned in the selection criteria, thereby boosting the academic diversity numbers. Additionally, in Round 2 of the selection criteria, non-engineers have higher scoring potential as compared to Engineers. Clearly, IIM-A is very serious about sending out a very diverse work-force into the corporate world in the coming years. MDI Gurgaon, a non-IIM premier management institute, has shown significant progress in admitting students from diverse backgrounds. With 82% Engineers in the Class of 2018, 80% in Class of 2019, and now 72% in 2020, MDI Gurgaon’s efforts to become a leading business school in all respects are paying off. On the other end of the spectrum, with almost 90% engineers in its PGP 2018-2020 batch, IIM Bangalore is one of the least diverse business schools in this report. This does not come as a surprise, as there are no points for academic diversity in IIM Bangalore’s selection criteria, even this year. Considering IIM Bangalore is known for recruitment by management consulting firms with an eye for students with an engineering pedigree, perhaps having a less academically-diverse batch could be explicable to some extent. IIM Calcutta is one of the least academically diverse business schools in this report. Even though the institute has points for academic diversity (including this year) while making the Final Merit List, the institute’s performance is below par when compared to other institutes. When looked at historically, IIM Calcutta has faced a deficiency of non-engineers for quite some time now – from the Class of 2014 to the Class of 2019, the percentage of Engineers has never dropped below 90%, going up till 95% for the Class of 2016. However, that also implies that this year’s academic diversity figures have been the best in a span of 7 years. IIMs Indore, Lucknow and Kozhikode have scope for improvement in the number of non-engineers in their future batches – especially the latter two, considering they have some points for academic diversity in their selection process. ISB (Hyderabad and Mohali campus), which offers a 1-year PGP programme, has 65% Engineers in its current total batch of 887 candidates, according to the official institute website. The data for NMIMS’s Class of 2020 (batch strength of 630 students) could not be obtained. However, it can be noted that the Class of 2019 has 75% Engineers, while the Class of 2018 had 78% Engineers. 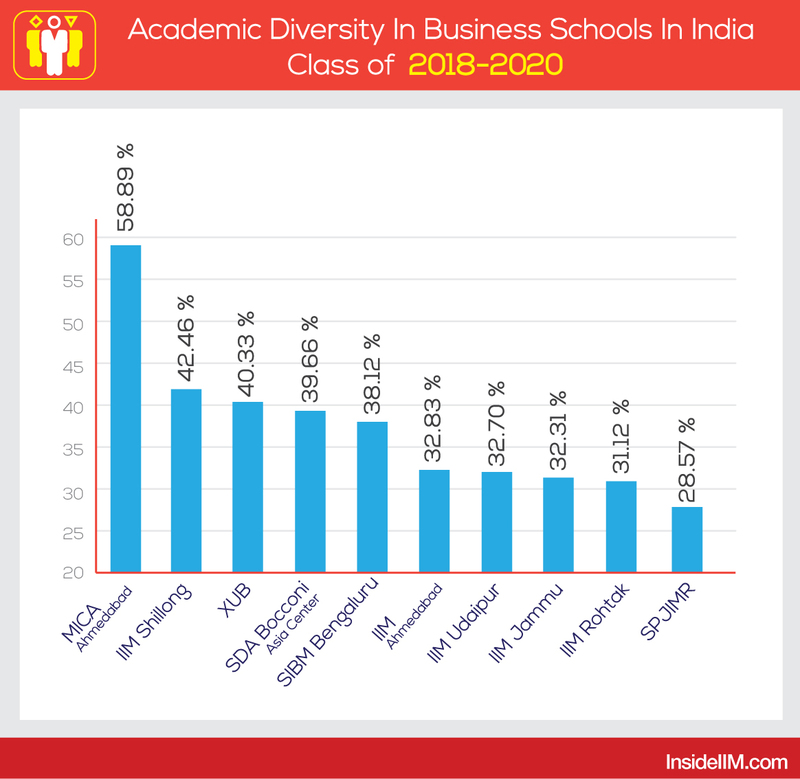 The batch-strength of these business schools ranges between 170-300, which still presents the challenge of balancing academic diversity; though to a lesser extent as compared to institutes which a greater intake. MICA Ahmedabad is not only one of the most gender-diverse business schools, but it is also the most academically diverse! MICA has no extra points for academic diversity in its selection criteria but still has more than half its batch from a non-engineering background. This could be attributed to the kind of job roles that are offered by recruiters at MICA, such as Media Planning, Account Planning in Advertising, Brand Management, Marketing Analytics, Content Marketing, Corporate Communications etc. – attracting individuals less inclined towards IT, Systems, Operations or similar functional areas. The ‘Mecca for Marketing’ is the epitome of a well-balanced management institute in terms of diversity and is the most diverse B-School in this report. Another relatively new IIM (considered an old IIM), IIM Shillong, has featured in this report as one of the most diverse business schools in the country, and the most diverse IIM in this report. Close to 2/5th of the entire Class of 2020 consists of non-engineers, with maximum students from a Commerce background finding a place for themselves in the institute. What is noteworthy is that, at IIM Shillong, engineers make up 87% of the Class of 2019 and 72% made up the Class of 2018, making this year’s figures a significant progress over the previous years’ performance. As officially the least diverse IIM in this report, IIM Kashipur’s efforts to increase academic diversity by adding it as a component in its selection criteria have not borne fruit yet. Unlike IIMs established around the same time as itself, IIM Kashipur has not been able to push for a more academically diverse batch since its inception in 2010. The academic diversity of NITIE Mumbai is one of the most expected results of the report, considering that the Powai-based institute does not have any openings for non-engineers for admissions to its PGDIM programme. With most of the recruiters looking for students to fill SCM and Operations roles, having a batch full of engineers is more than helpful in offering a perfect candidate for the job(s). NITIE is truly a Gem for GEMs. IIMs Trichy and Ranchi, established in the same year as IIMs Udaipur and Raipur (respectively) and just 3 years after IIM Shillong, need to catch up on the academic diversity that their counterparts have already achieved. The data for SIBM Pune (batch strength of 180 students) and FMS Delhi (batch strength of 231 students) could not be obtained. The B-School with a 1:1 ratio between male and female students has also almost attained the same results when it comes to academic diversity. With 46 non-engineers going into the corporate world by 2020, SDA Bocconi Asia Center has the highest number and percentage of non-engineers in this cluster of B-Schools. IIM Jammu, the 4th most diverse IIM, is the youngest management institute in this report, having been established in 2016. The institute has a relatively small batch size but has maintained a respectable percentage of non-engineers in its 3rd PGDP batch of 2020. An interesting observation in IIM Jammu’s academic diversity is that even with a 38% increase in batch size from the Class of 2018 to the Class of 2020, the batch diversity has increased from close to 80% engineers in the Class of 2018 to 68% engineers in the Class of 2020, which is a significant increase of 12 percentage points in a matter of 2 years. JBIMS, the 7th least academically diverse management institute in this report, has a massive scope for improvement when it comes to academic and gender diversity. 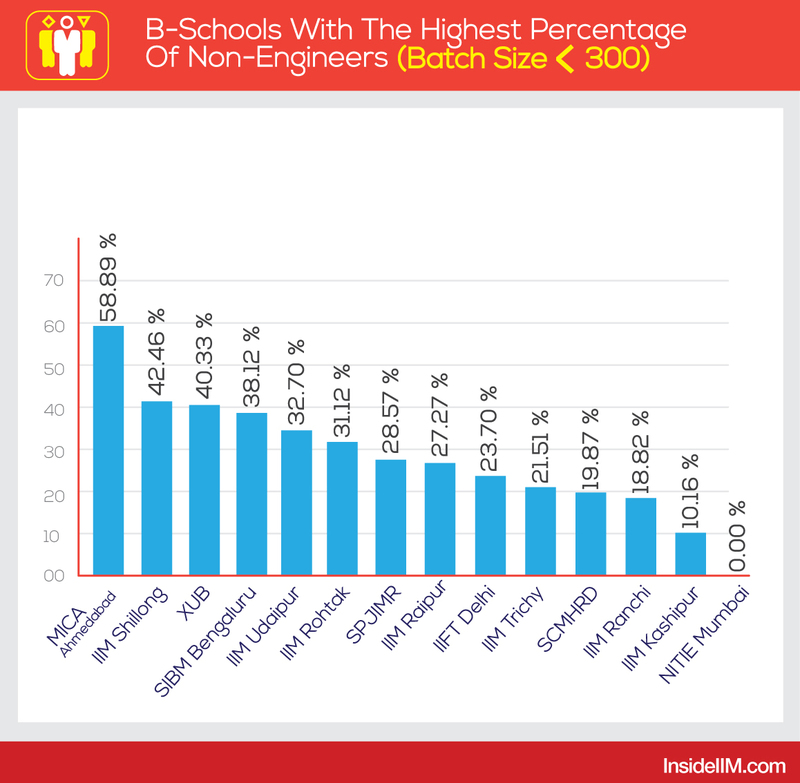 Even though it is an IIT, SJMSOM, which has almost the same academic diversity as that of NITIE Mumbai, can definitely work towards inviting more non-engineers in its future batches. It is a well-known fact that the majority of business schools in India have an issue of academic and gender diversity. 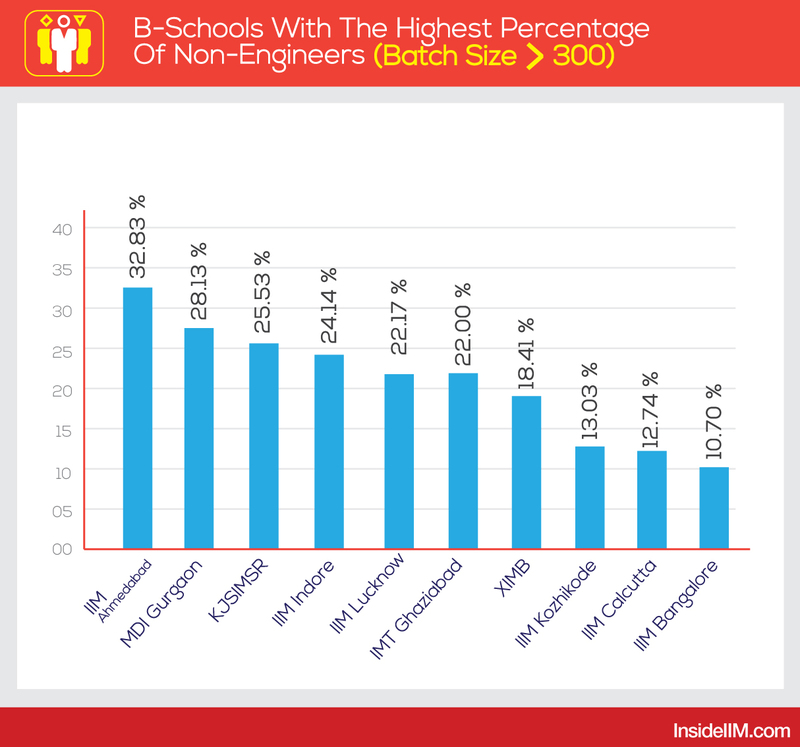 Engineering graduates find themselves as an overwhelming majority within their batch. This can be attributed to the apparent advantage that Engineering graduates may have with Quantitative Ability in the entrance exams, as well as a larger talent pool as compared to other academic streams in India. This can adversely affect classroom learning and may also not meet the requirement of campus recruiters. “The moment one enters a Harvard classroom, one would find a diverse student body. It’s like United Nations. Students are economists, computer scientists, historians, litterateurs while 95% students at IIMA are engineers. However, this report highlights that the top management institutes of the country are walking the extra mile to change the status quo and invite more non-engineers to take admission. This can be seen through additional points for academic diversity in the selection criteria of most business schools for the past few years.